Click on the image to receive our weekly special offers! 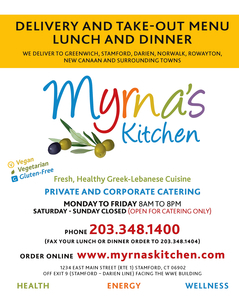 Myrna’s Kitchen offers breakfast, lunch and dinner items such as appetizers, lunch boxes, crêpes, deli sandwiches, pita and whole wheat wraps, salads, and homemade dinner entrées. The wide selection of fillings includes Boar's Head top-quality meats, and vibrant, flavorful and healthy Mediterranean foods, as well as delicious vegetarian, vegan and gluten-free options. We offer meat, chicken and fish dishes--all prepared with simple, healthy, fresh ingredients and great care.